In the Kronos Quartet’s 45 years of groundbreaking music-making, it has sold more than 2 million records, commissioned over 950 new musical works, played thousands of concerts worldwide, nabbed a Grammy Award, and enjoyed a long-term creative partnership with Krannert Center. In its newest project, Kronos Quartet teams with Oscar-nominated filmmakers Sam Green and Joe Bini for a multimedia performance piece that blends live music and narration with archival footage and filmed interviews with such prominent artists as Philip Glass, Tanya Tagaq, Steve Reich, Wu Man, and Terry Riley. 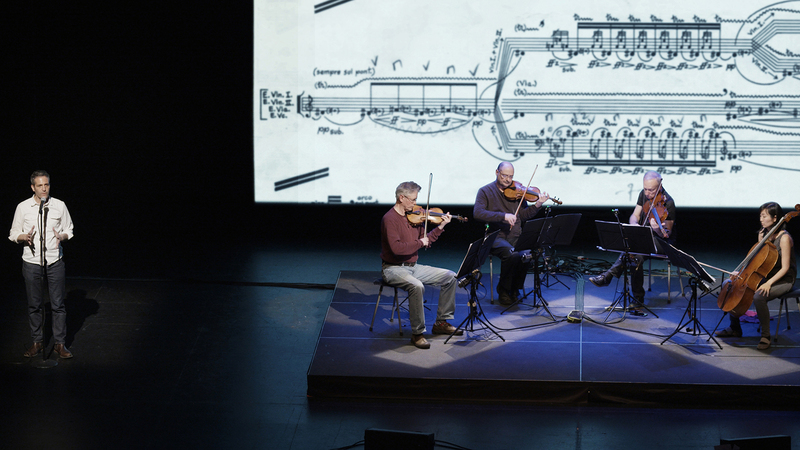 As Green tells the multi-decade and continent-spanning story of the pioneering string quartet, Kronos revisits its extensive body of work, performing music by George Crumb, Laurie Anderson, John Cage, and many others. Together on stage, Green and Kronos interact with the stirring cinematic imagery on screen to craft an important record and exploration of late 20th- and early 21st–century music. Transcending the typical live music and film event, this collaboration quickly becomes a meditation on music itself—the act of listening to it closely, the experience of feeling it deeply, and the power that it has to change the world.